Pay attention to low-slung parts of the vehicle, such as the spoiler and exhaust, particularly in the following situations. When driving on poorly maintained roads and tracks. When driving over kerb stones. When driving on steep ramps, etc. Particular attention is necessary for vehicle with a sports suspension and when then vehicle is fully laden. The following instructions must be observed if vehicle damage is to be avoided when driving through water (e.g. flooded roads). Determine the depth of the water before driving through it. The water level must not reach above the web of the lower sill » Fig. 111. Do not drive any faster than at a walking speed. At a higher speed, a water wave can form in front of the vehicle, which can cause water to penetrate into the engine's air intake system or other parts of the vehicle. Never stop in the water, do not reverse and do not switch the engine off. Driving through water, mud, sludge etc. 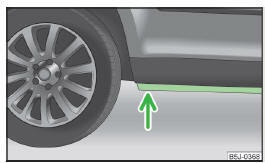 can reduce the braking power and extend the braking distance – there is the risk of an accident. Avoid abrupt and sudden braking immediately after water crossings. After driving through bodies of water, the brakes must be cleaned and dried as soon as possible by intermittent braking. Only apply the brakes for the purpose of drying and cleaning the brake discs if the traffic conditions permit this. Do not place any other road users in jeopardy. When driving through water, some parts of the vehicle such as the engine, gearbox, chassis or electrics can be severely damaged. Oncoming vehicles can generate water waves which can exceed the permissible water level for your vehicle. Potholes, mud or rocks can be hidden under the water making it difficult or impossible to drive through the body of water. Do not drive through salt water. The salt can lead to corrosion. Any vehicle parts that have come into contact with salt water must be rinsed immediately with fresh water. We recommend that the vehicle is checked by a specialist garage after it has been driven through water.